Elpress Crimp Tool PVX1300 for Cu Terminals (Range 10-400mm²), Al Terminals and Connectors (Range 10-400mm²) and C-sleeves (Range 6-120mm²) is a battery powered crimp tool for crimping of Cu Terminals type KRF/ KSF from 10 to 400mm², KRD/ KSD 10-400mm², KRT/ KST 10-400mm², Al Terminals and Connectors 16-240mm² and C-sleeves up to 120mm². PVX1300DB, supplied with 2 batteries. PVX1300-US, supplied with 115 VAC charger. Uses the same dies as T2600, V600 and V611. Crimping tool on the next level, the crimping head made from 100% recycled steel. The Crimp Tool PVX1300 crimp pistol is the latest tool equipped with Elpress’s patented DUAL technology. The tool is 100% reverse compatible and has been tested and approved for use together with Elpress B-dies and DUAL dies. One new feature of the pistol is a display that gives you valuable information about your tool, e.g. number of performed crimps, battery status, service intervals, etc. The Crimp Tool PVX1300 has been created with a new ergonomic design & crimping head that offers you, the user, enhanced performance. The fork is made from 100% recycled steel and has been tested for quality and safety. The tool is supplied with a 2-year guarantee. There is also the possibility to set a “safety start” on the tool (adjustable crimping operation start with optional one or two ‘click’ trigger for safer handling of the tool). DUAL technology should be used in particularly severe conditions, such as in trucks, wind power plants and trains, where apart from their electrical properties, the joints are also exposed to corrosion, mechanical resistance and vibrations. Contact crimping takes place in a two-stage movement, first a hexagonal crimping that provides optimal symmetrical contact with the conductor, which means that no wires are broken or come apart in the edge facing the terminal. This is followed by an additional indent crimp, which provides 30% better electrical properties. 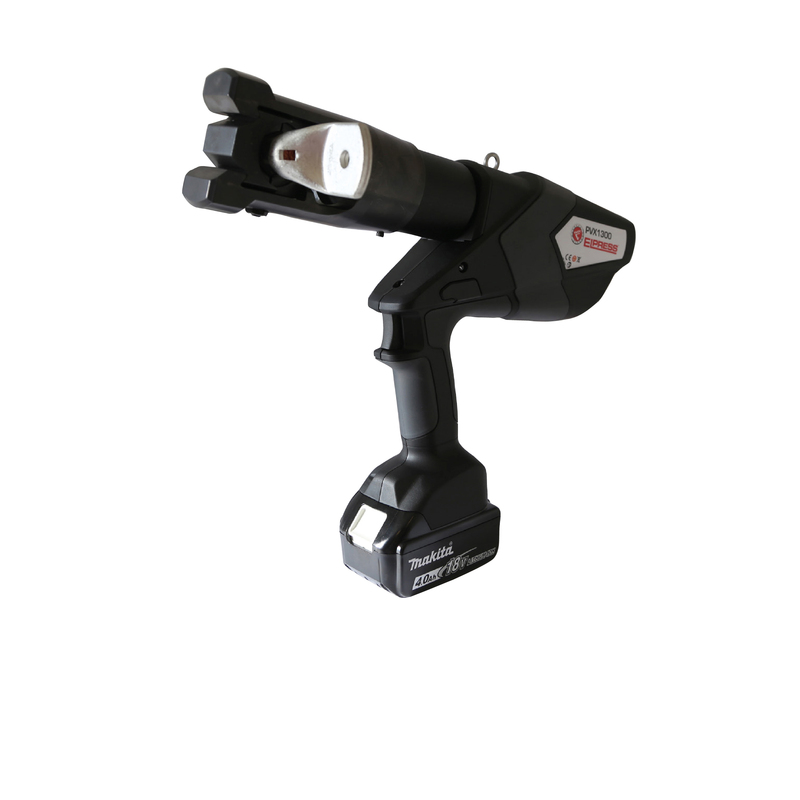 This product has replaced Elpress Crimp Tool PVL1300 for Cu Terminals (Range 10-400mm²), Al Terminals and Connectors (Range 10-400mm²) and C-sleeves (Range 6-120mm²).